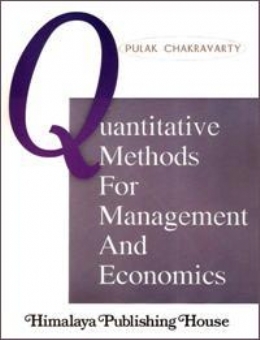 "Quantitative Methods for Management and Economics" is specially prepared for the MBA students in India and all over the world. It starts from the basics, such that even a beginner with out much mathematical sophistication can grasp the ideas and then comes forward to more complex and professional problems. Thus, both the ordinary students as well as "above average: i.e., "bright and sincere" students would be benefited equally through this book. Since, most of the problems are solved or hints are given, students can do well within the short duration of the semesters of their busy course. (A) Preliminary Mathematical ideas and its application in Management and Economics. (B) Numerical Methods. (C) Statistics for Management & Economics. (D) Operations Research. (E) Research Methodology. It is hoped that this book will be used as an unique reference book for students of Business Administration (i.e. MMS/MBA/PGDM) as well as Economic (MA/M.Sc.). It will be also useful for Research scholars, M.Phil. and Ph.D. students, as a reference book.